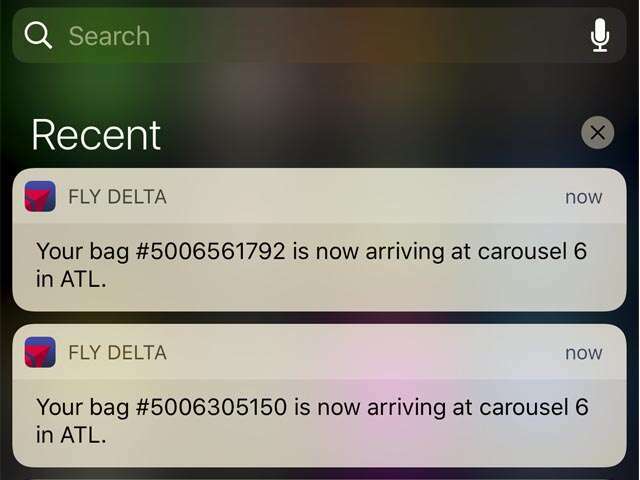 Before your next Delta flight download the Fly Delta app to receive push notifications about the status of your checked bag! Radio Frequency Identification (RFID) bag tags are already attached to bags everywhere Delta flies, and customers are reaping the benefits. Customers will now receive live push notifications from critical points along their bag’s journey. A quick note will let a customer know when their bag is successfully loaded onto an aircraft, which carousel it will arrive at for pickup and more. Delta is the only carrier that has implemented an RFID bag tracking solution on a global scale to further improve its already-strong reliability for checked bags. A recent study from the International Air Transport Association showed that an industry-wide global RFID solution could reduce the number of mishandled bags by up to 25 percent by 2022.